Welcome to the latest edition of cute things from my closet that didn't get the royal treatment from Photographer Husband! As a reminder, you can see most of these looks on Instagram and Instagram Stories, but for those who don't use the ‘gram or want the deets on where to get these pieces, here you go! Okay this is a cheat because I did an outfit post with this look. 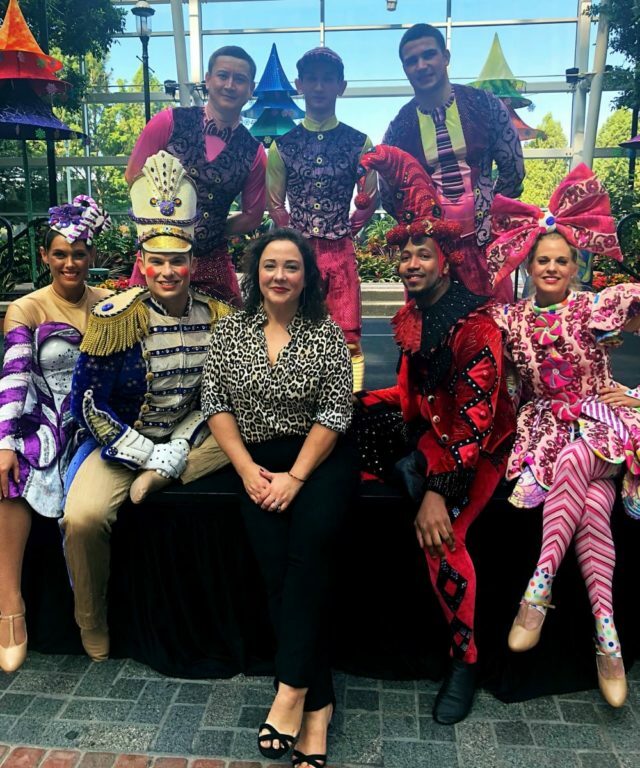 However, how could I resist sharing a photo of me with some of the cast of the holiday performance that will be taking place this winter at the Gaylord Resort National Harbor. A few bloggers were invited to get a preview of the holiday spectacle for the venue and then invited to lunch in the resort atrium. What to wear when you'll be dashing around the cobblestone sidewalks of Georgetown for various events at their shops when it's hot and humid and you're having your period and your hair is not cooperating and you're just not in the right mindspace for such an occasion? 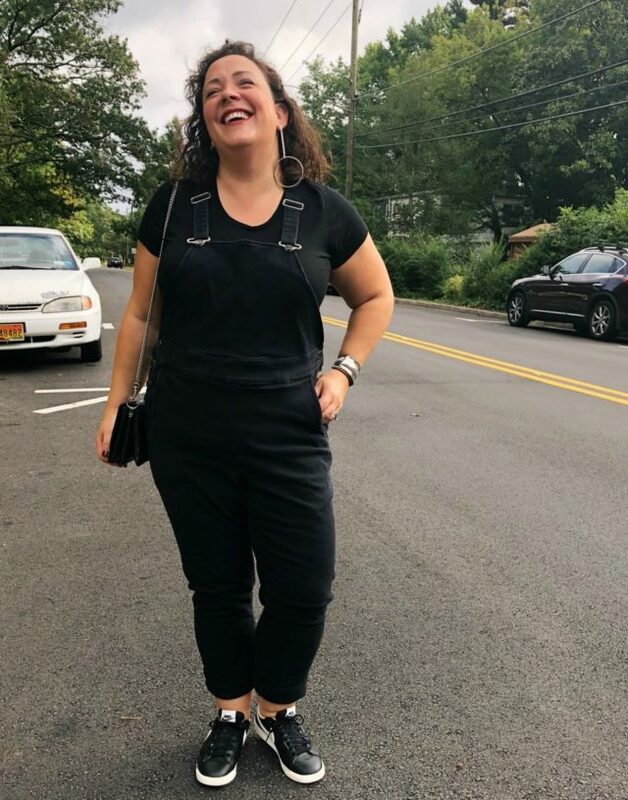 Overalls, and try to make it fashion with mismatched earrings. I knew I was going to a Washington Nationals baseball game for a while. I ordered a super cute t-shirt and a Nats bandana to tie around my neck three weeks in advance. The t-shirt arrived two days after the game, the bandana still hasn't arrived. 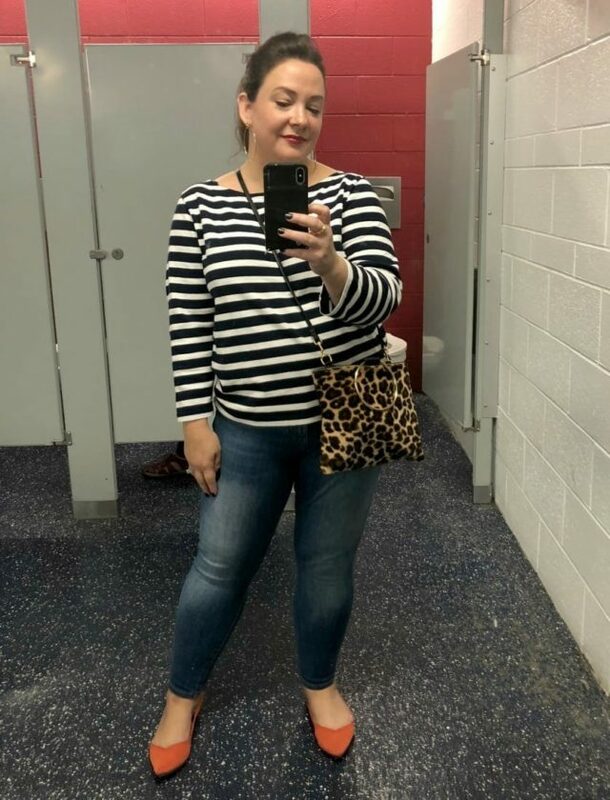 I made do with what was in my closet – navy and white stripes and a red lip. 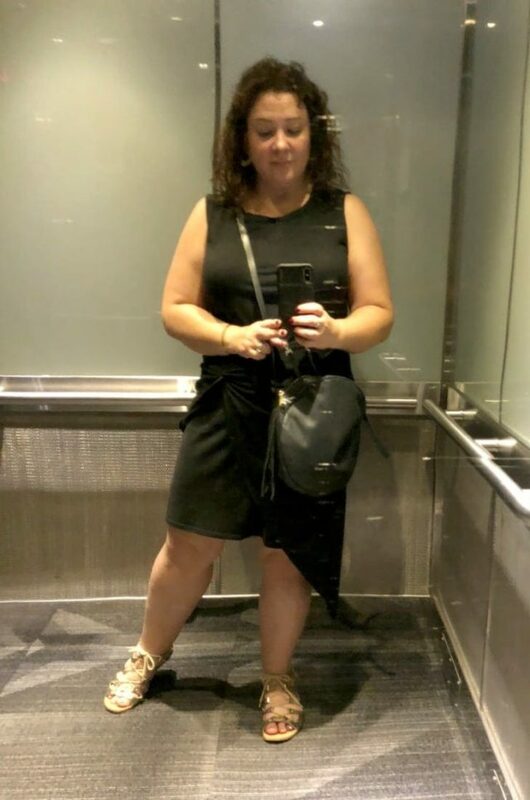 The crossbody bag was perfection, the shoes comfy, and the teased-front ponytail with lots of Saints & Sinners hairspray made it so my hair wasn't an issue in the heat and humidity (and that my stylist is on a much-needed vacation and I am desperate for a root touchup and cut). Back-comb those bangs you're growing out but may bring back, use two barrettes to hold them in place, bring everything into a ponytail and '80s mall bang spray the heck out of the whole head. I love this hairspray, the brand sent it as a gift but I love it more than any other hairspray I have, even Elnett and Forceful 23 and all the other cult favorites. It not only works and truly is brushable out (didn't have to wash or heat treat my hair the next day to have good hair), it's free of talc, gluten, parabens, phthalates, iron oxides, mineral oil, synthetic colors, nut ingredients, palm oil, and aluminum salts. Oh, the brand is also cruelty-free. An organization near and dear to me and my mom's heart wanted volunteers to be in a TV spot they are creating. We headed to the city early one weekday morning to be filmed and if we're used I'll be sure to share it! We were told to wear solid colors. I love the color of my blue Universal Standard Geneva dress (see on the blog in this post) and thought it would be a good choice. There was a chance I wouldn't have time to go home after the shoot before a blogger event that afternoon so I dressed in case I had to go straight there. 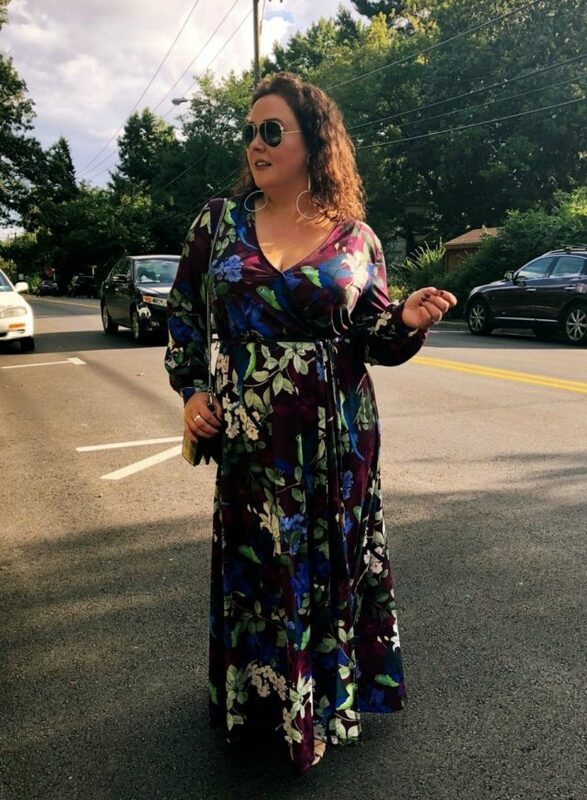 I hiked the dress up on my hips and thanks to the silhouette of the dress, it stays there comfortably and looks purposeful. I paired with skinny ankle jeans and then a bold shoe so it looked more fashion blogger. Big earrings and a printed bag to complete the look. This is from the blogger event I went to after the shoot… I had about 30 at home before heading back out. 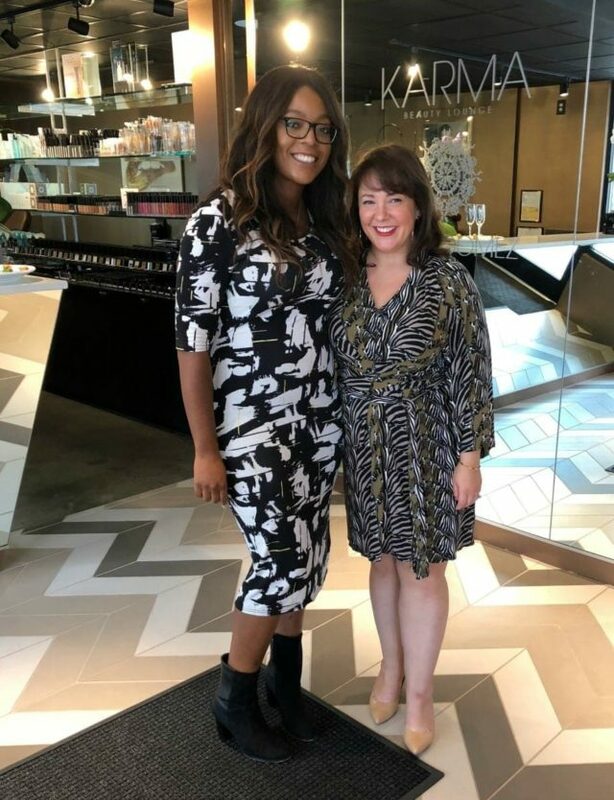 It was a Mommies Tea at KARMA by Erwin Gomez salon and day spa, an intimate event with only a handful of influencers. I got my brows reshaped by Erwin Gomez himself and a fantastic blowout by Marlon, seen in this picture with me. I was honored to attend and so impressed by the staff and salon. 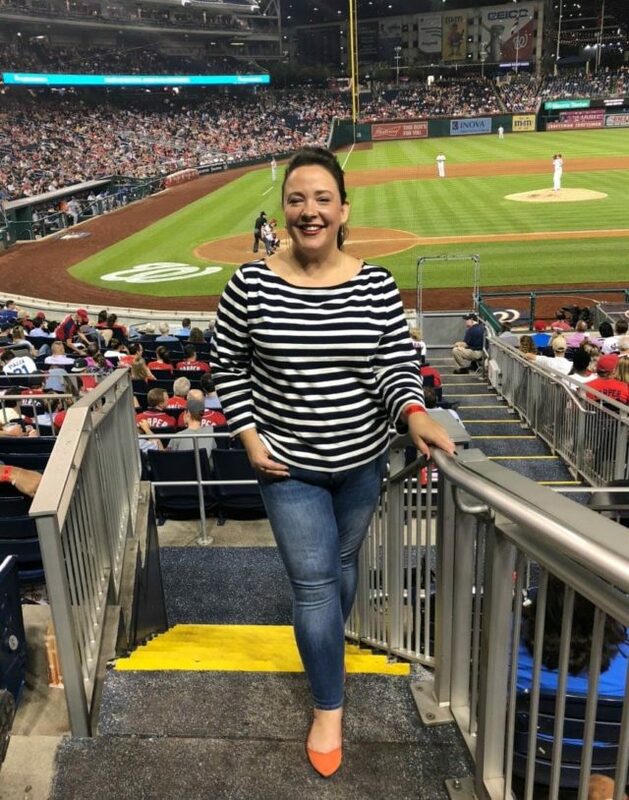 I'm glad I changed from the jeans and top, but wish I had more time to pull together my hair and makeup before the event as many pictures were taken (I'm only sharing the after photos, dahlink!). As for the dress, it's years old from a collaboration between Issa and Banana Republic. You can see it on the blog here. Running errand style. 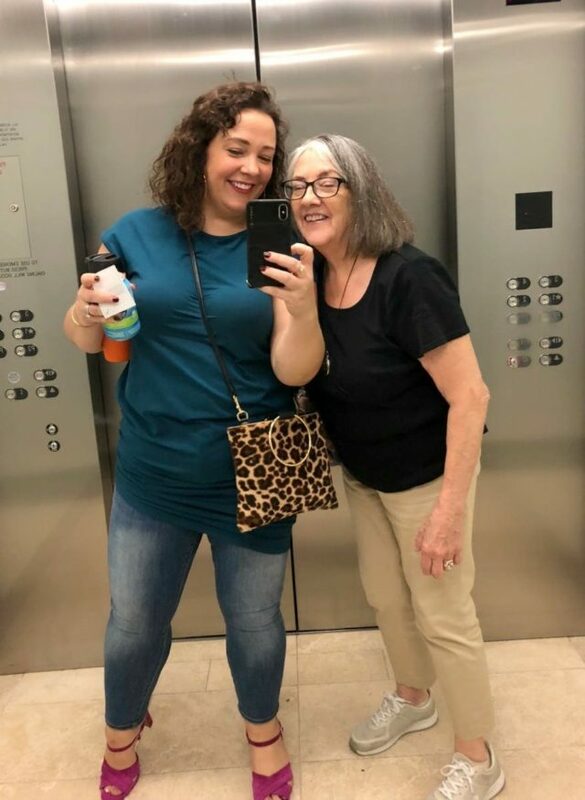 I captured this photo in an elevator going up to meet a friend at her office so we could do lunch. You originally saw this dress in this blog post and it has been a favorite all summer long. Doing my best blogger pose as our Uber shows up. Wore the dress from this blog post out to dinner with my husband in the city, then stopped by Ampeer where Tulani, an R&B singer and harpist was performing. This dress has been in the wash twice and still looks like new (see me wear it on the blog in this post). The front slit makes it easy to walk and do a little Angelina at the Oscars move! 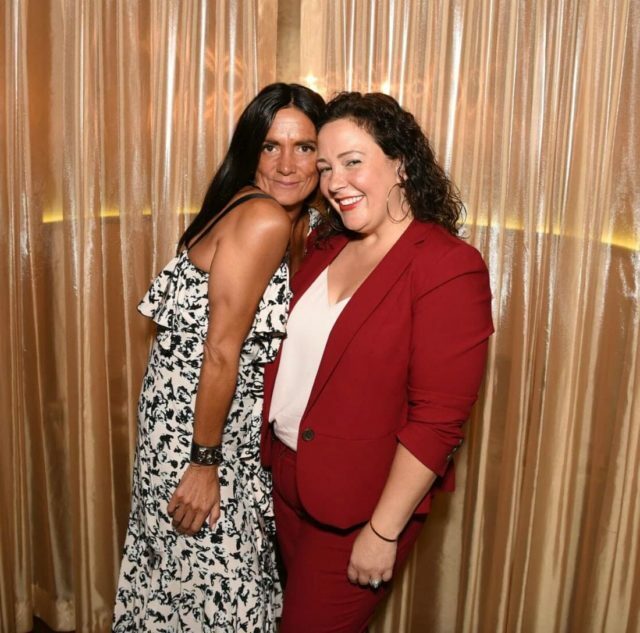 My friend Sylvia had her 50th birthday celebration at Alhambra which is located in the iconic St. Regis Washington DC. 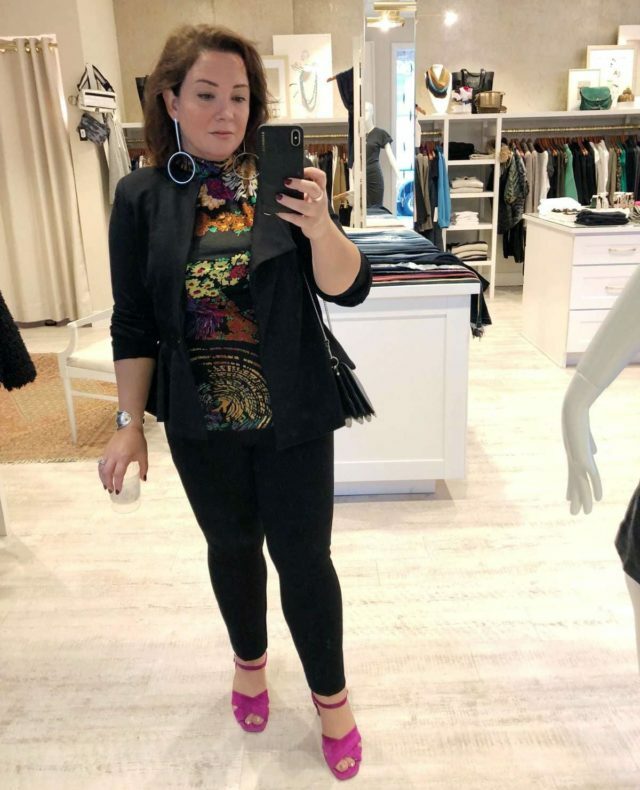 For this luxe brunch I wore the same pants from this outfit post with my pale pink cami (previously seen here) and the blazer to match the pants (I switched my 12 R for a 14 P). I hope to photograph this very soon for an actual blog post, but am sharing now since so many asked about this look when I shared it on Instagram Stories. (second photo is by the awesome Emma McAlary who shot my 10th blog anniversary party). This is also a look I hope to recreate for the blog very soon. Those who follow me on Instagram are familiar with it. 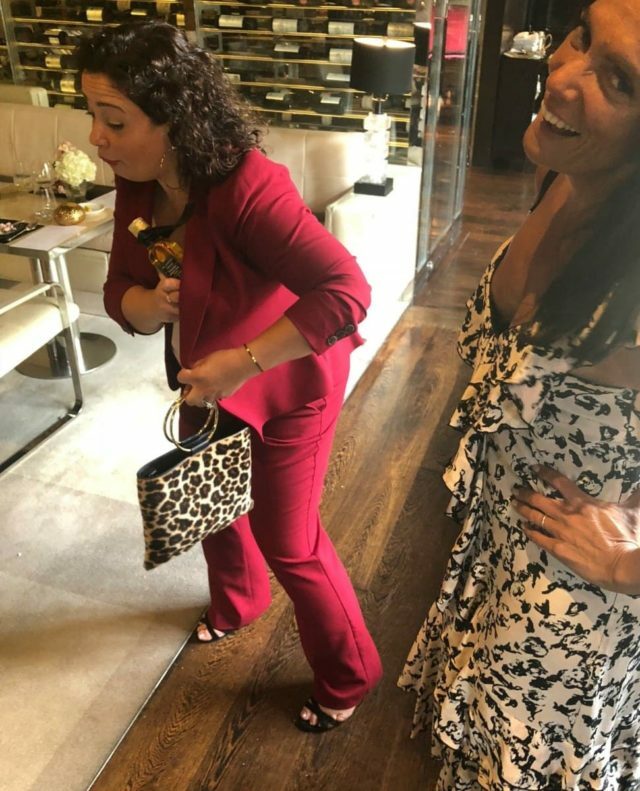 I wore it to a boutique that was hosting a pop-up for Denisa Piatti jewelry. The top has matching wide leg cropped pants. I bought the set on Etsy years ago and miscalculated my measurements. I never got rid of it because I just loved it so much. I wen t to try it on by chance the other week and was excited to see the blouse now fits! The pants are a hair too snug, I'm not really trying to lose weight but I'll keep the pants because this body shape keeps changing and shifting and they may work in the future! You look good on duty or off duty. You look so tall next to your Mom and so short next to Marlon. No value judgement intended. It’s just an observation about how much variation there is among humans. Here’s the value judgement – both women’s and men’s clothing designers need to take notice of this! So true, my mom is constantly complaining about the lack of petites and Marlon likely has the same complaints about too-short inseams! Thanks for sharing these with us–so many great looks on you! i kind of want to drive to DC right now to get my hair and brows done–ha, ha (it would only take 2 or days to get there)! Fabulous job! He really is amazing! Though I’m far too low maintenance to even drive an hour for a beauty treatment LOL! The last two months have been one frizzy hair day after another !